"A unique holiday gift idea that is sure to bring a little joy to the season! 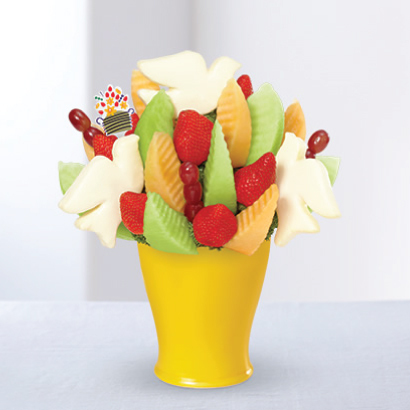 Our Peace & Dove Daisy fruit bouquet features a festive, dove-shaped pineapple dipped in decadent white chocolate, sweet pineapple daisies, and an assortment of fresh strawberries, honeydew, cantaloupe and grapes. Container and color may vary."